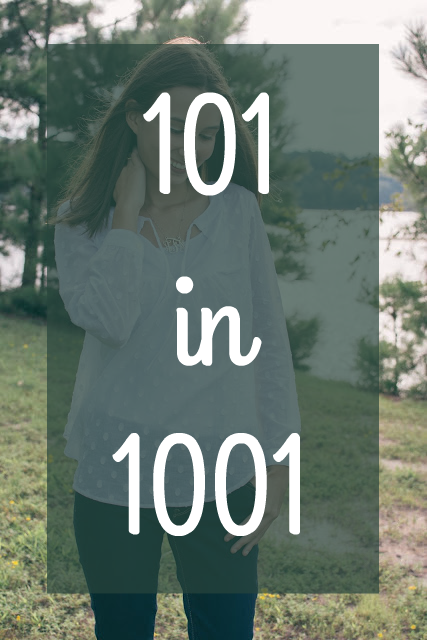 I'm so excited to share today's post, it is a collaboration about one of my favorite things with one of my favorite bloggers, Desirae from The Lonestar Prep. 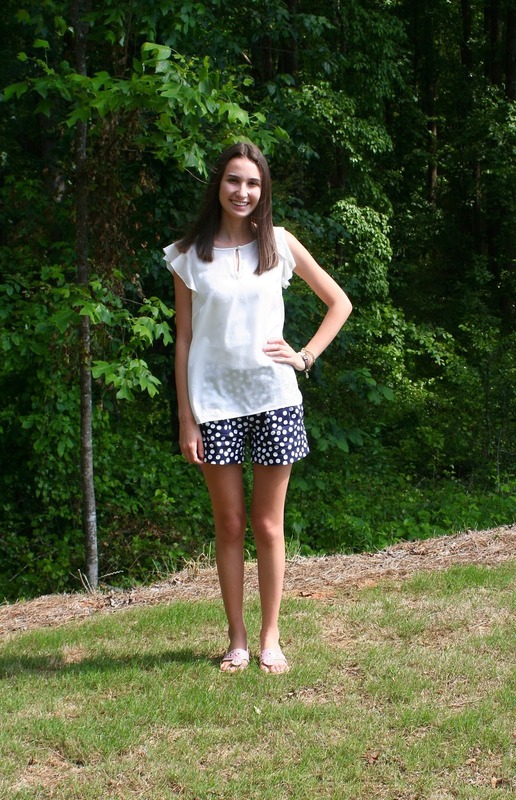 We both are sharing our summer essentials and our go-to summer outfit! Finish reading my post and then head over and check out Desirae's post as well. Sunglasses: Sunglasses are not only important for protecting your eyes, but they also make the perfect summer accessory. 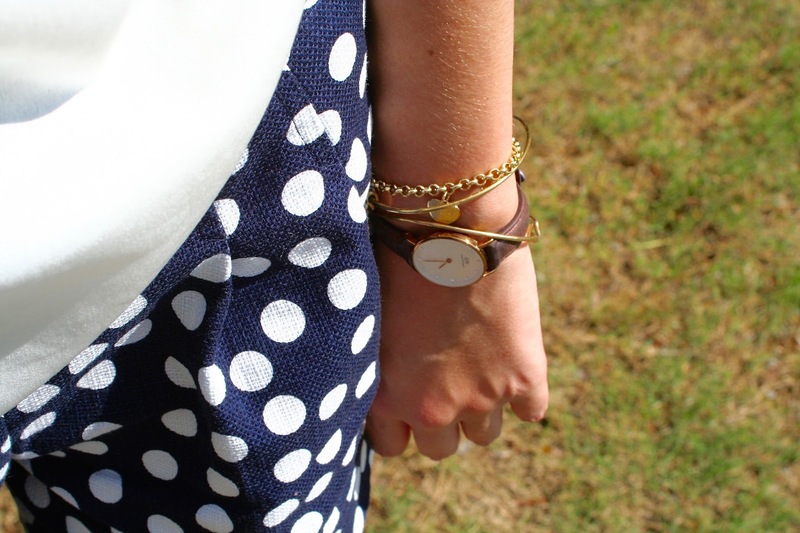 They are often just the extra thing an outfit needs. Swimsuit: It's always great to have a fun new swimsuit for summer! Sunscreen: This is my favorite sunscreen for my face. I use it almost every day during the summer to help protect my skin, it is one of the most important things you can do for your future skin. Bangles: I love to wear my Alex and Ani bangles in the summer because they add a fun touch, but they are not heavy. I love to wear them with shorts, dresses, and even swimsuits. They are my go-to summer accessory. Hat: I used to hate hats, but this year I fell in love with hats. 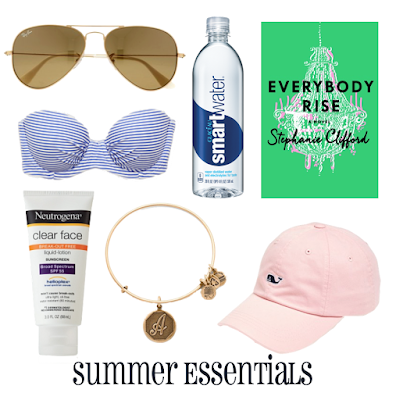 They protect your face from the sun, but they also make a super cute addition to any summer outfit. Smart Water: It is very important to stay hydrated during the summer. I love Smart Water because I feel like the electrolytes give me a little strength and energy, though it is probably all in my head. Book: My summer is always filled with books, I read by the pool, the lake, and sometimes I will spend the whole day reading. If you are looking for a book, check out my recommendations here. Everyone needs an outfit that is super cute and can be pulled out of your closet on a moments notice when you need to rush out. I had to rush out to an early breakfast at school, and this outfit was absolutely perfect. 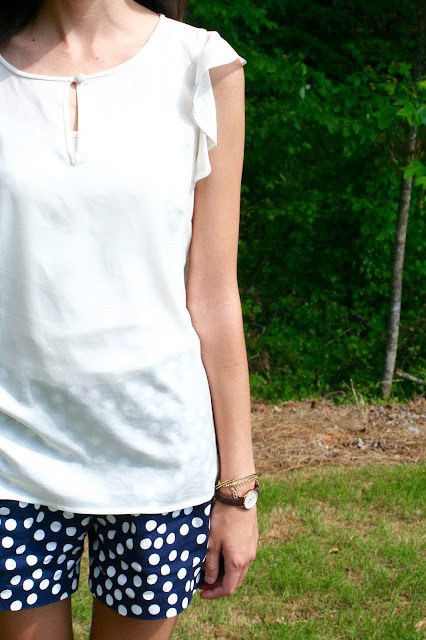 For me, I always gravitate to a plain white top with printed shorts. 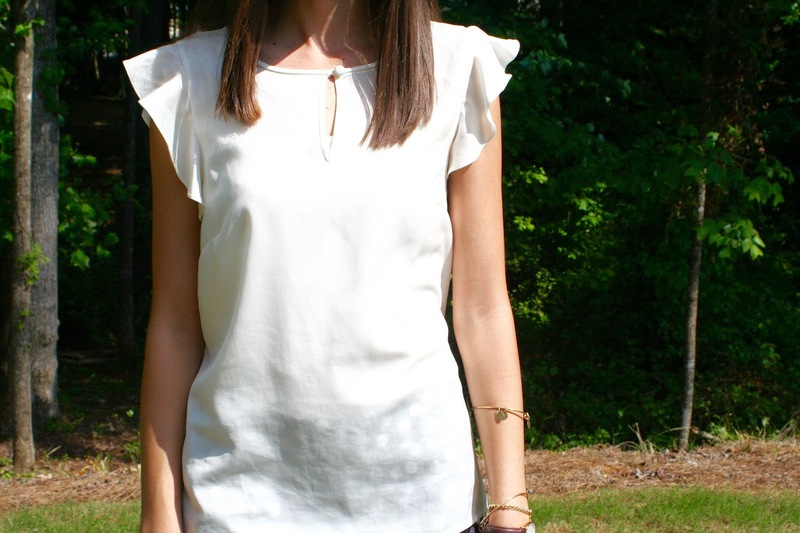 I love this J.Crew Factory flutter sleeve top because it is solid white, but it has some super fun detailing with the sleeves. These shorts are definitely one of my favorite summer purchases, they are classic, but yet the polka dots create interest. 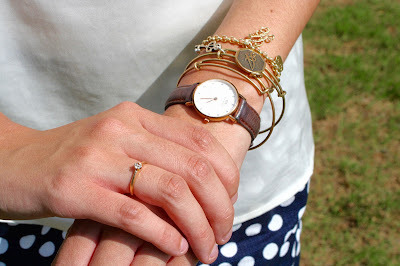 I always add my favorite Alex and Ani bangles and some fun colorful Palm Beach Sandals. 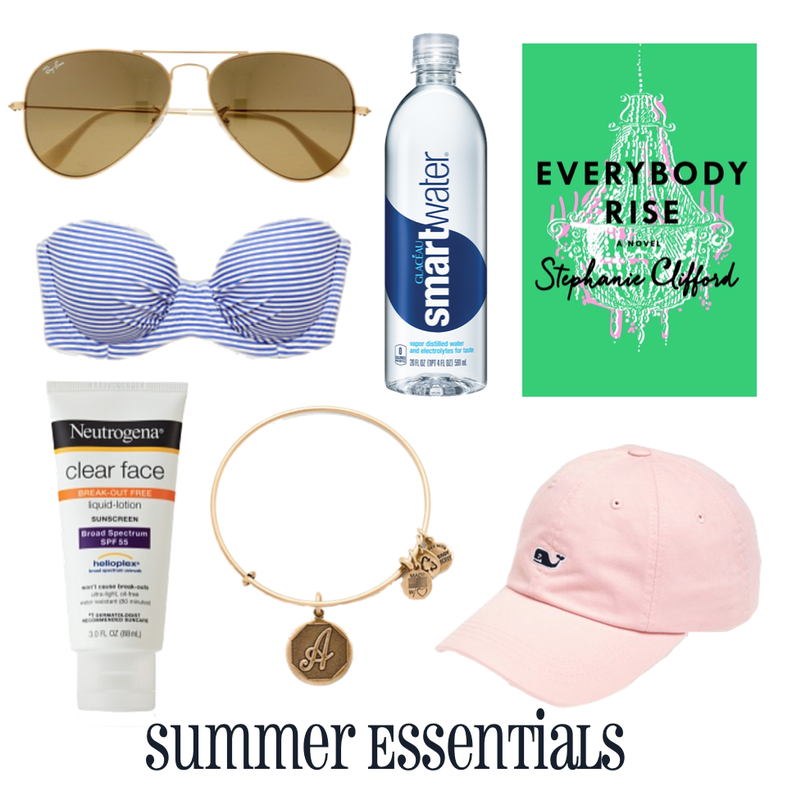 I'd love to hear about your summer essentials and your go-to summer outfit, leave me a comment or connect with me on social media! Also, don't forget to check out Desirae's post! Love this outfit!! This collab was so much fun! Thanks and yes it was!! I love all your picks! So ready for summer! Thanks girl! I know, me too! !